Production time for single piece 2-3 weeks. Edit design Knit Sweater color gradient , or create your design from scratch. Knitted color gradient sweater, made to order with your design from 1 pc already. No minimums, design a crewneck knitsweater with your favourite striped fashion design. Choose 4 colors from the yarn palette and create your design. Only at Wildemasche. MADE IN GERMANY at the Wildemasche knit factory. Sizes S to XXL, choose in the Online designer. Please read the notes for cut and sizes. Keep elements a few cm from edge so they don't get cut off. 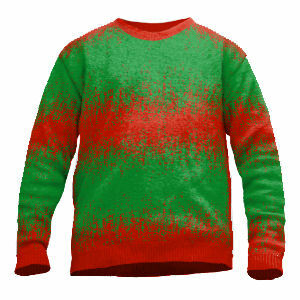 Perfect christmas sweater / xmas jumper / knitted fashion piece.